Tackleworld Miami are experts in camping & outdoor accessories, providing everything you need to enjoy a great weekend in Australias natural beauty. We stock a wide variety of camping gear such as tents, shelters, furniture, bedding, cooking, gas, lighting, refrigeration, safety, medical appliances, toiletries and hygiene. Our experienced staff are here to assist you in all of your camping and great outdoor adventures, so feel free to drop into the store and get a closer look at what we have to offer. Take it fishing, camping or use it in your own backyard or patio. The Ozpig is great when entertaining outdoors.Relax and enjoy the warmth of an open fire in safety while you boil the billy and cook up a feast. The simplicity and versatility of the Ozpig makes travelling, camping and cooking an enjoyable experience for everyone. Tackle World Miami are the premium stockists for Ozpig and accessories. Plus, you’ll find the range of Rome cooking accessories available in store. Kipor portable generators feature high performance ‘sine wave’ digital inverter technology. This provides high quality, stable electricity making them ideal for all your power requirements and suitable for frequency sensitive appliances such as laptops, TVs and other precision equipment. Lightweight, quiet operation and completely portable, Kipor digital inverter generators are perfectly suited for camping, caravans and trade applications. All Kipor digital inverter generators feature high efficiency, 4 stroke petrol air cooled engines with low emissions and quiet operation. Weekend Getaway or Trekking accross the country? Come see us before you go! re-useable and disposable gas bottles, gas hoses and connections, we have what it takes to keep the troop’s belly’s full of hot grub. 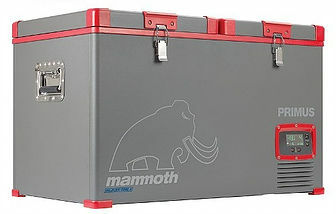 As your local stockists of Primus Mammoth fridges we carry every size in the range. With its unique split lid in the dual zone line and wide seal for an air tight close the Mammoth fridge/freezer range is one of a kind. We’ve got gazebos, shades, shelters and all the accessories you need to have a great weekend if your out camping, heading to the beach or heading down to set up shop at the markets! Everything you need to keep comfortable and warm whether on school camp, out bush, sleeping on the beach or have the family over in the holidays!